Premiums, loss sums, past claims, insured values, damage probabilities – these are just a handful of the bewildering array of variables which confront the insurance industry. It is challenging simply to keep track of these factors, much less to actually spot trends and relationships in this mountain of data. The insurance sector is taking advantage of high-quality maps used in conjunction with a GIS solution to manage these vast quantities of information and pinpoint trends and relationships that would otherwise not be apparent. Maps in the form of geodata yoke together the many types of information used by the industry and make it possible to extract more insight from the available data. "Geodata" here refers to the usage of maps not just as visualization tools, but also as data repositories that can be used to store, analyze and link together disparate types of information. 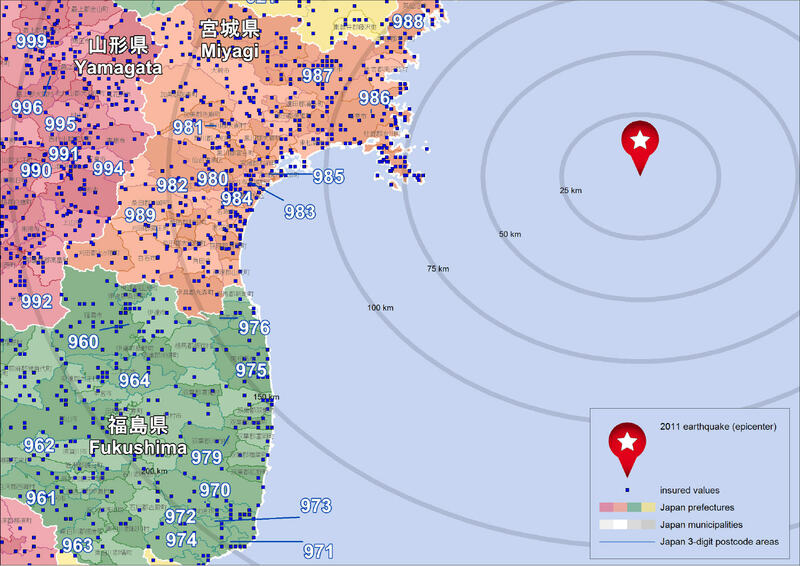 This article uses maps of Japan to illustrate some of the many applications of geodata in the insurance sector, which range from managing risk and determining insurance premiums to carrying out reporting activities. Put simply, the ability to visualize, analyze and combine data of various types on maps is indispensable in an industry required to track such a diverse range of factors. An initial step when working with maps is to illustrate the specific points of impact. 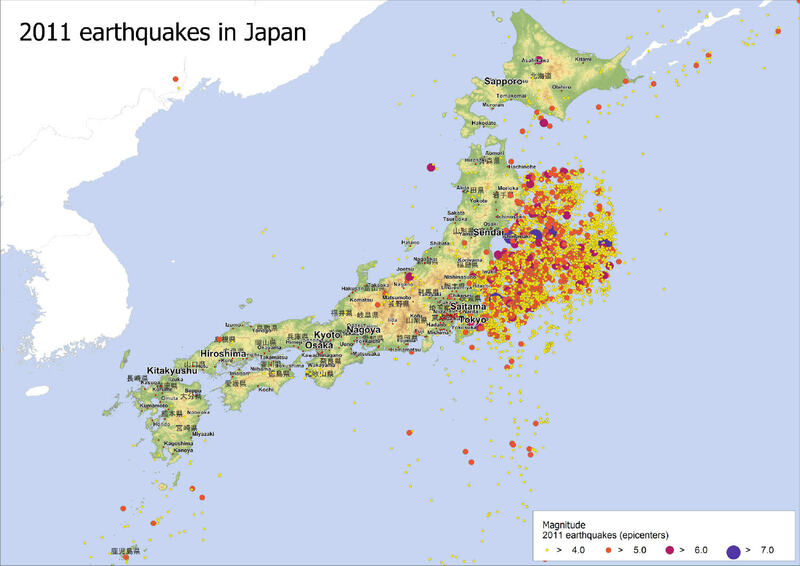 Depicted here are the 2011 earthquake epicenters in and around Japan (fig. 1). The points on the map represent the geocoded locations of the earthquake epicenters, while the colors and sizes indicate the levels of magnitude. This simple visualization makes it easy to quickly spot the areas of the country closest to the points of impact and therefore at greater risk. The next step is to drill down into one of the higher risk areas along the northeast coast of the country (fig. 2). Pictured on this map is the epicenter of the 9.0 magnitude earthquake that occurred on March 11, 2011. Zones have been created so that the distance from the epicenter to the nearby municipalities can be quickly gauged. This gives a better idea of the specific cities that are most vulnerable. While it takes time for actual losses to be reported, preliminary loss estimates can be generated by importing data on the locations of insured values. These insured values are illustrated by blue dots on the next map (fig. 3). This information can then be cross-referenced with any available exposure data – in this case, the distance of the insured values from the earthquake epicenter. Importantly, this map also includes boundary data – namely, the prefecture and three-digit postcode boundaries. Each number corresponds to a three-digit postcode, while the white lines depict the prefecture boundaries. As illustrated, maps can be enriched with an ever increasing amount of detail and data. This is the real power of working with geodata: Data of disparate types can be linked in order to reveal trends and relationships that would otherwise be impossible to discern. In addition to data on losses and risk probabilities, external market data such as information on population density and income levels can easily be incorporated for added insights. All of this information is stored in the tables associated with the maps, allowing them to function as data repositories. Once information on losses from a natural catastrophe (nat. cat.) 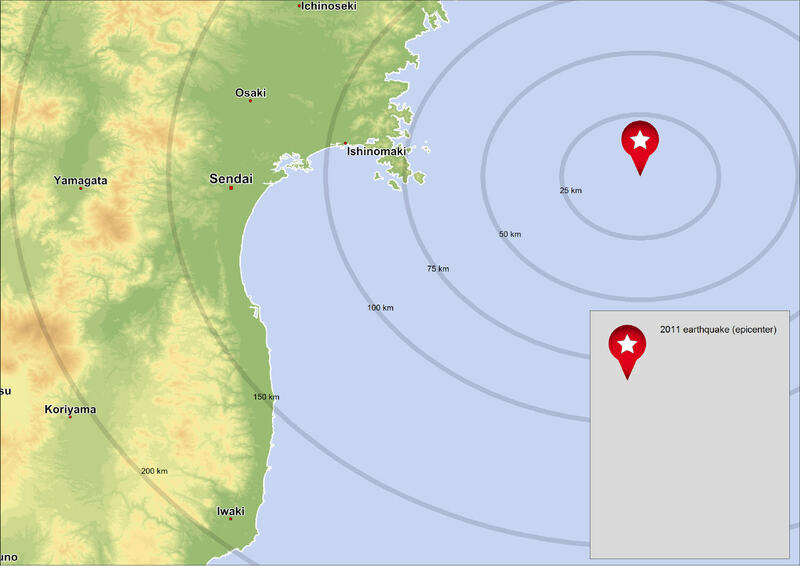 becomes available, it can be visualized on maps in order to show the scope of the damages. 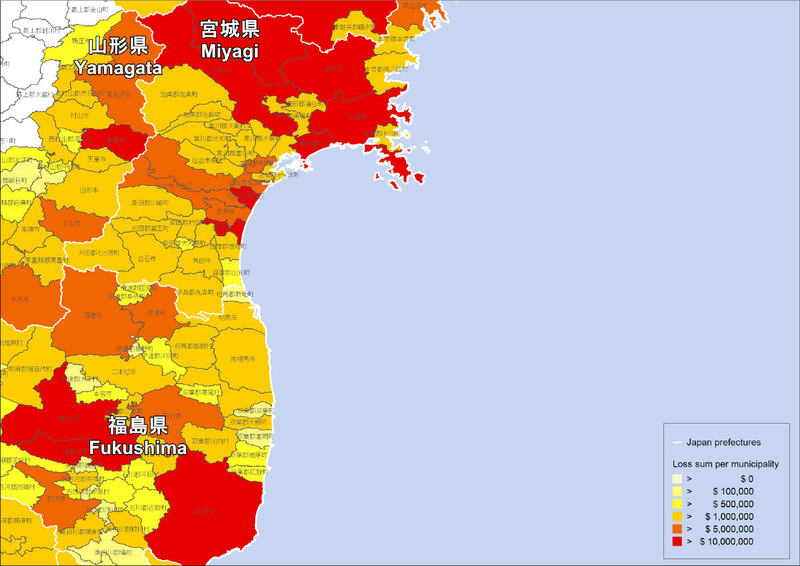 The next map in the series depicts the loss sums associated with the insured assets (fig. 4). The assets themselves are represented by the blue squares, while the size and color of each square indicate the extent of the losses. This makes it easy to quickly pinpoint the specific regions where losses are highest. Many of the highest losses occurred along the coastlines, a feature of digital maps that should be very granular when used for insurance purposes. "Detailed, pristinely digitized coastlines are absolutely essential when geocoding asset locations and associated loses in the insurance industry," explains Klaus Dittmann, head of cartography at GfK GeoMarketing. "Many high-value assets are concentrated along coastlines, so maps used for risk management and nat. cat. planning should offer as much detail as possible in these areas. As a key supplier for the industry, we invest a great deal of effort in these aspects of our maps." Once losses have been fully assessed in the wake of a natural disaster, a logical next step is to adjust premiums. As illustrated by the next map, zones can be created that express the new risk levels (fig. 5). Assets that fall within higher-risk zones are assigned higher premiums. In this case, the higher-risk zones correspond to the cluster of municipalities along the coastline. These are shaded red and assigned the highest premiums. In addition to managing risk and adjusting premiums, maps are ideal for aggregating loss sums and visualizing these values on various regional levels. This is useful for reporting purposes and showing how losses are distributed across a given market area. This is illustrated by the next map, where regions are color-coded to quickly show the areas where losses are greatest (fig. 6). 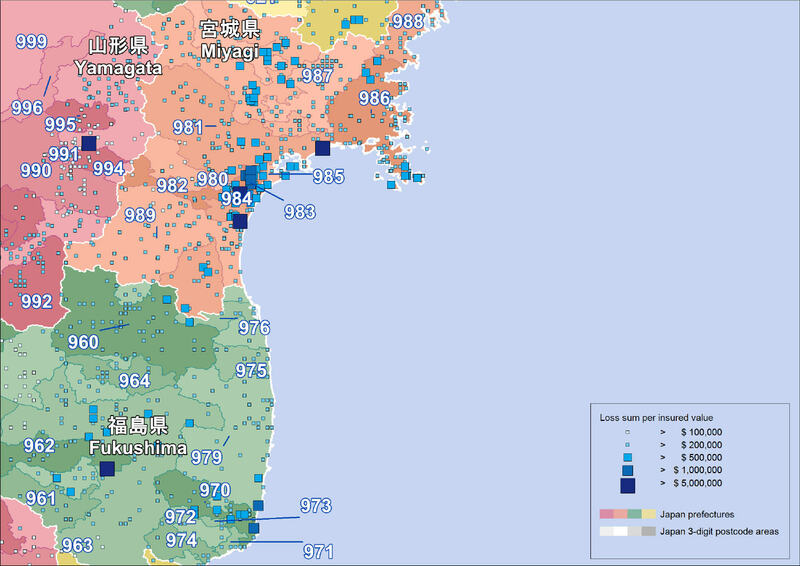 While the previous map illustrates the data at the three-digit postcode and prefecture levels, this map focuses on the municipal boundaries. This ability to work with data at various regional levels is another benefit of employing specialized digital maps. "Maps of administrative and postal boundaries are the ideal basis of analysis, because they give users a ready-made regional structure for moving between different levels of detail depending on the data that needs to be evaluated," explains Doris Steffen, business development manager at GfK GeoMarketing and the company's chief liaison with clients in the insurance and reinsurance industries. "Another advantage offered by postcode maps is the fact that almost all assets are already associated with a postcode, which makes it quick and easy to import this information into the maps." A collection of various types of boundary data gives map users the ability to select the level of detail based on the task that needs to be performed. For example, working on a broader regional level is often more suitable to comparing information across a broader market area. 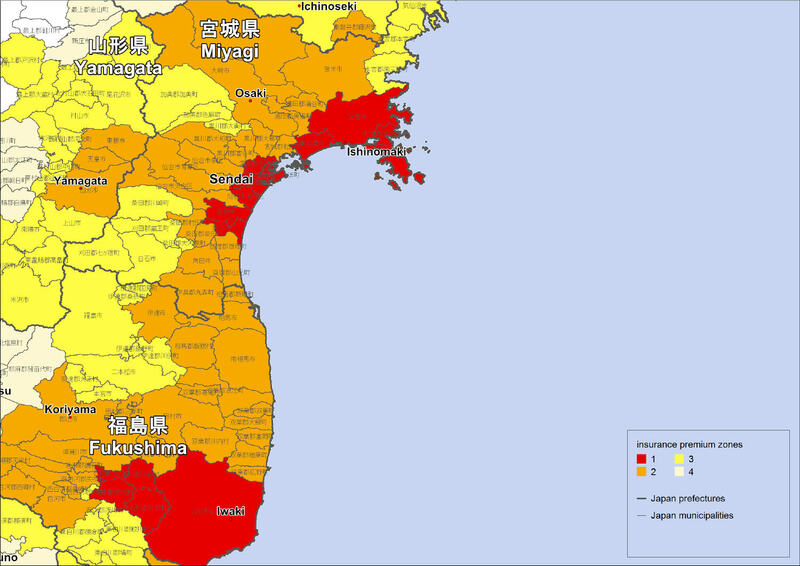 This is illustrated by the next map, which uses the prefecture boundaries to show how losses vary throughout this region of Japan (fig. 7). 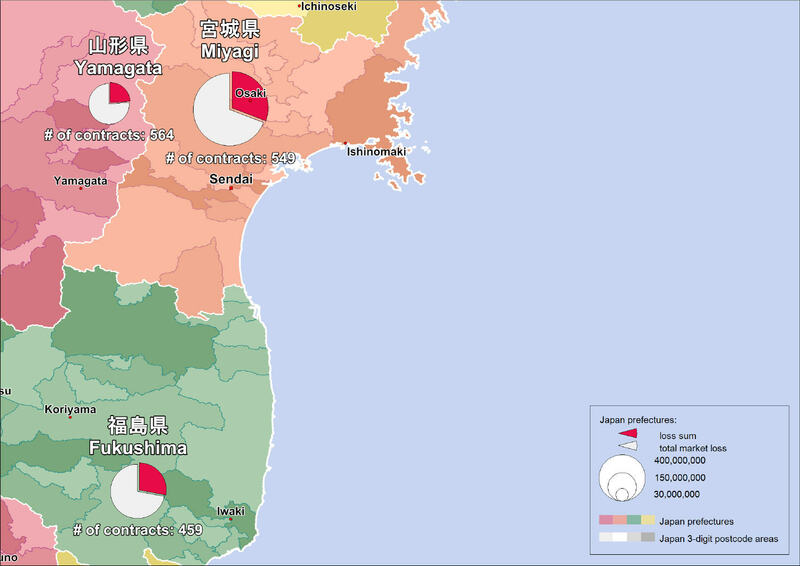 The size of each pie chart is scaled to indicate the relative magnitude of the loss in each prefecture. The red portion of the pie chart represents the insurance company's losses, while the gray portion shows how this value compares with the total market loss. "This ability to move between different granularities is essential given the diverse variables and data management tasks faced by insurance and reinsurance companies," says Steffen. "For example, when maps are used for reporting purposes, sensitive point-based data can be aggregated to a higher regional level to preserve anonymity." There are some important considerations to bear in mind when acquiring geodata for applications in the reinsurance industry. Not all maps are created equal, and the insights that maps make possible are only as good as the maps themselves. In addition to providing comprehensive coverage, boundaries of all regional levels should be up-to-date and fit together seamlessly, without gaps or overlaps. Errors and inaccuracies result if any postal polygons overlap or if there are areas that fall outside the boundaries of the polygons. Maps for all needed areas should be of a consistent quality – otherwise, it's impossible to carry out meaningful cross-border comparisons. The levels of detail and accuracy are also vital, particularly in the case of coastlines, where assets are frequently concentrated. If coastlines are not carefully digitized, geocoded assets may appear to be located offshore, or inlets and outcroppings may be obscured. Assuming these requirements are met, maps give users in the insurance and reinsurance industries a powerful means of linking data on past claims and losses with current values and premiums, as well as risk probabilities and estimated future damages. By visualizing and analyzing these disparate variables on high-quality digital maps, trends and relationships that would not otherwise be apparent can be readily discerned. The resulting insights allow users to streamline their operations and better manage risk across their entire market. *Author’s Note: Note that the data related to the depicted insured values and losses is fictitious and used purely for the sake of illustrating the related map applications.